Cannes is now known as a city of festivals, glitz and glamour, an exclusive seaside resort full of yachts belonging to the rich and famous. All true, the once small fishing village though is incredibly family friendly and there are accommodation alternatives to suit all types of budgets. We saw plenty of bronzing bodies in the sand, luxury hotels, designer shops and Michelin starred restaurants but also a host of other tamer city charms. One afternoon we climbed aboard the little tourist train, we weren’t too keen but Son managed to convince us it would be a good idea. Actually it did turn out to be a fun way to get our bearings and a good way to see the town. 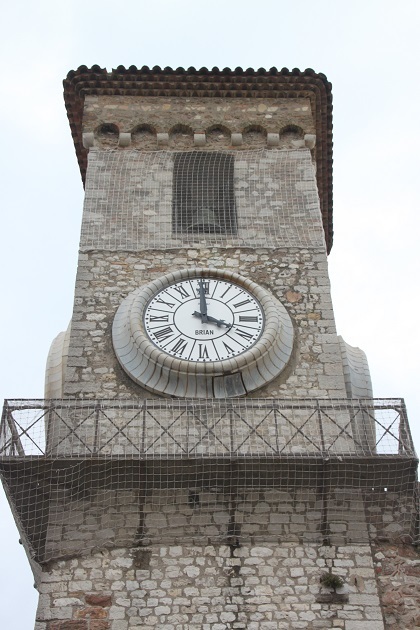 The trip lasted just over an hour, we went along La Croisette but then weaved our way up and through the streets of Le Suquet – the old town – all the time listening to a very interesting commentary on headphones. 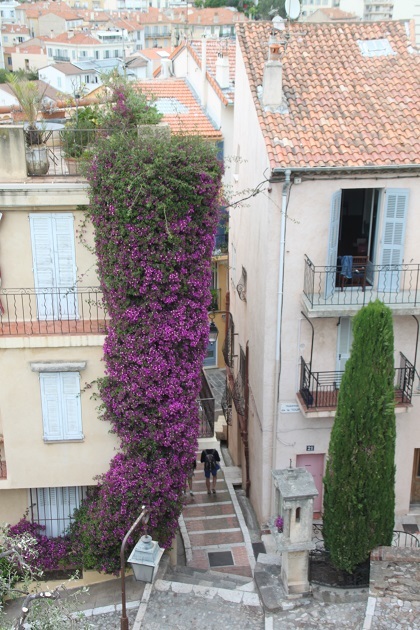 I loved it as we climbed the medieval slopes of the old town. 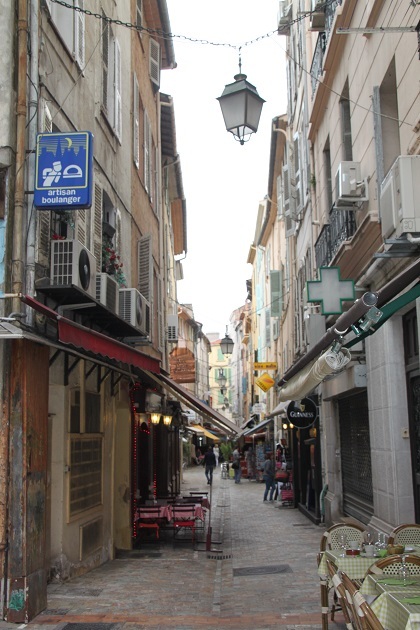 The narrow and winding streets are just gorgeous, packed closely together and filled with restaurants. The lanes are cobbled and there are zigzagging stairways everywhere. 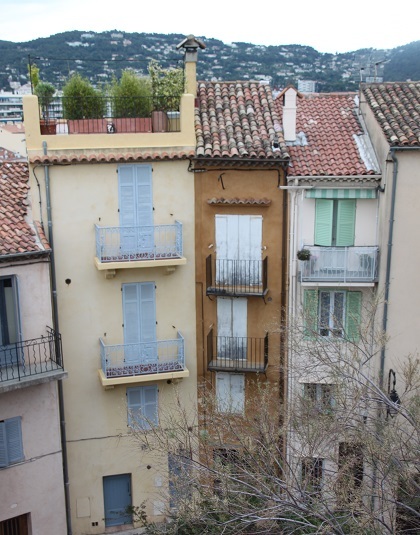 The houses have wonderfully pastel and faded facades and you really see the heart of Cannes here – you can imagine this place before the filthy rich arrived. 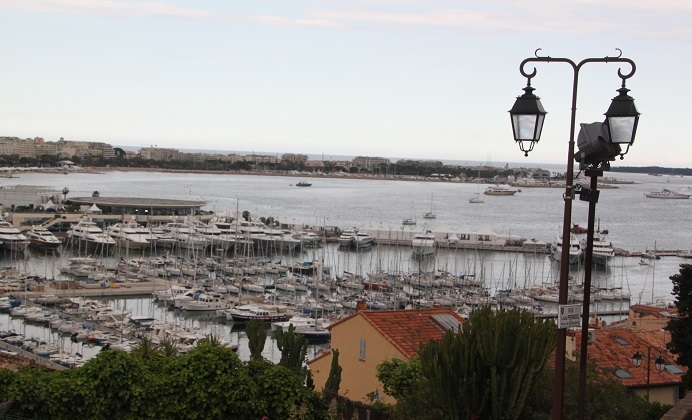 Cannes was once a small fishing village concentrated in this area. Apparently Le Suquet still has its own dialect and although it is undeniably touristy, it is still charming and exceptionally quaint. 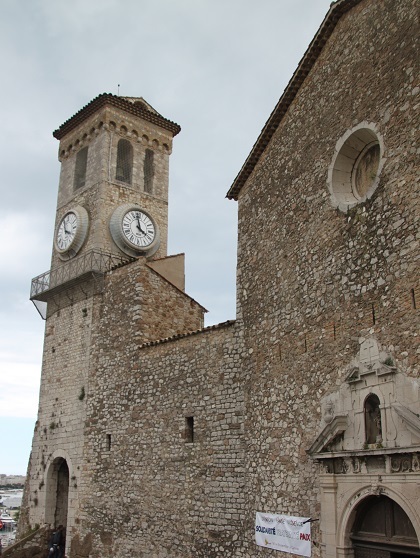 We trundled right to the top in the train to the clock tower and the ruins of Castre Castle – the 11th century citadel built by Lenin’s monks. 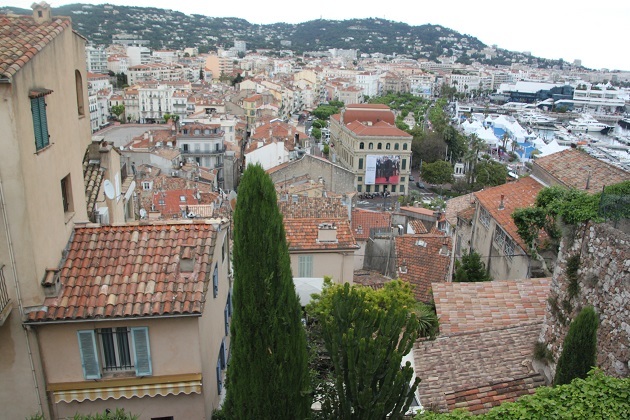 Up here there is a breath-taking view of the Bay of Cannes, the harbour below and the streets of the city. 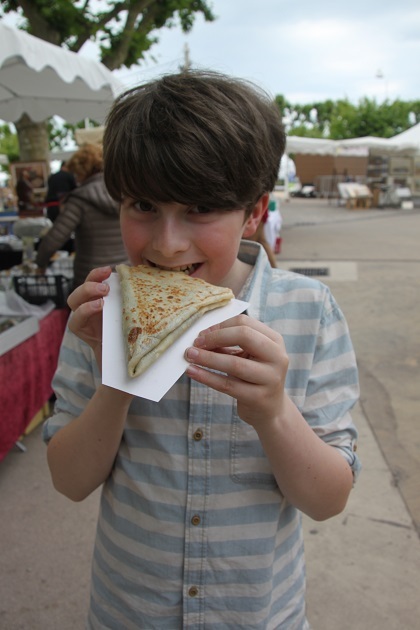 Once off the train it was time for a crepe – Son thinks it’s always time for a crepe in France…. Then we walked back to the old town to explore the streets on foot a bit more and finished off with a rather nice cocktail – a day well spent. Seems like such a lovely quaint town! We always associate it with the glamorous film festival. There is so much more to it – we were the same, think of Cannes and the Film Festival comes straight to mind!! Me too!! So much character and so much more beautiful. Definitely the best side of Cannes. How picturesque. It was stunning, so different from the beach and flashy hotels most people think of – my favourite part of the city. 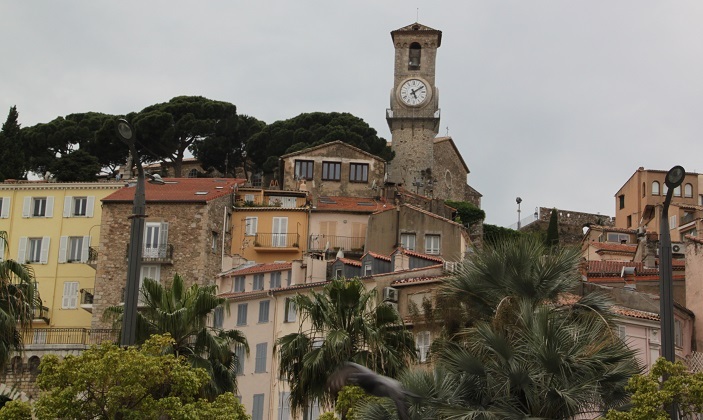 A perfect day in Cannes, and taking the little train up the steep hills meant you didn’t have to climb up them yourselves. 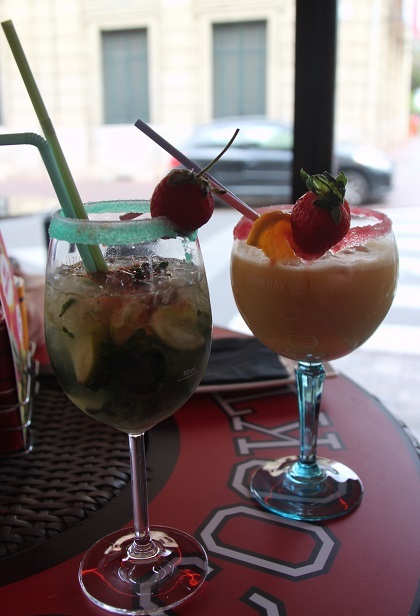 Cocktails are also the perfect end to a day on the French Riviera! I agree completely – sitting in the sun sipping something delicious is the perfect end to the day. That train also definitely saved our legs!! Thank you for sharing such wonderful pictures and places. I can’t imagine seeing such beauty. Love the architecture and colors! It is a special place, the faded old buildings are so gorgeous, we loved exploring. I quite like those tourist trains and have been on a few in Italy and Spain – a good way to see everything in a short space of time without having to walk. They do look silly though! This one definitely saved us a hike up a very steep hill, it did look silly but trundling up in the heat I really didn’t mind!! They just seem to be packed together – I loved the faded colours and all the pastel shades, so picturesque. Yes completely! I hope you frame some of these photos when you get home! It looks so beautiful there. I live in North America, so obviously we have nothing like that at home. It’s a beautiful place, stunning architecture and beautiful colours, we loved exploring and taking it all in. Very different to what we have in the UK too!! 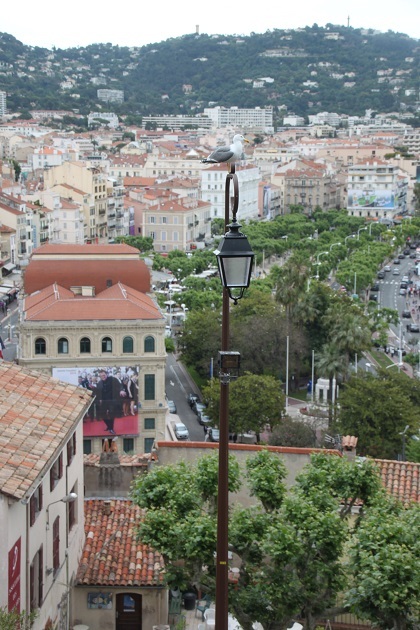 Really interesting take on Cannes! Looks like a lovely place to explore. It is a gorgeous city, the beach and seafront hotels are impressive but the old town was my highlight. Looks lovely! I’m sad we missed it when we were in the Riviera in May. Hope there will be a next time so we can visit there too! It’s a lovely place to explore – so much to see and do, definitely recommend if (when) you go back!! Thanks, Joy. I didn’t realise Cannes was like that. I know what you mean Coral – my first thought was the Film Festival and then the beach, the old town was a lovely surprise and so beautiful. Oh the old town looks like an excellent place to get lost in wandering around. I am right there with your son on the Crepes, they are marvelous. He, it seems, can eat his body weight in crepes most days in France!! Luckily there are plenty of hills to walk them off!! Thanks! 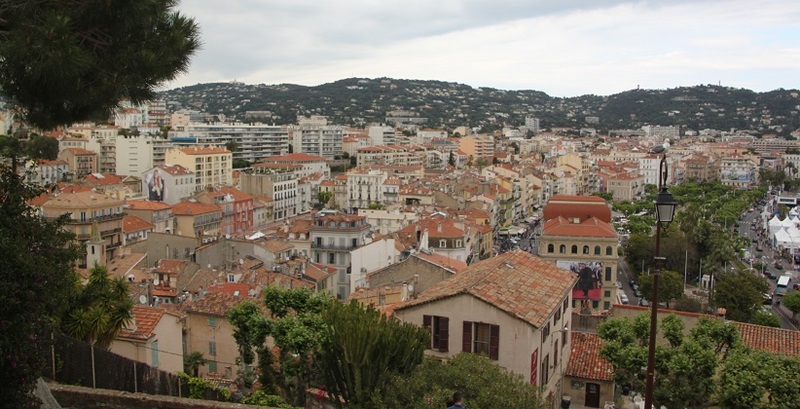 Last week were in Nice, I wanted to visit it but they had the festival going on so we decided to avoid the crowds. Now I know next time we are around there, it would be a wonderful place for a stroll! It is busy during the festival but not bad at all for strolling we found and it adds something to the atmosphere. Festival aside though there are plenty of great places to explore. I didn’t even know this part of Cannes existed. So Beautiful. I have in,h associated it with glamour and movie stars. Me too, it was such a lovely surprise to find this incredible old town area with a maze of streets and lanes to wander! 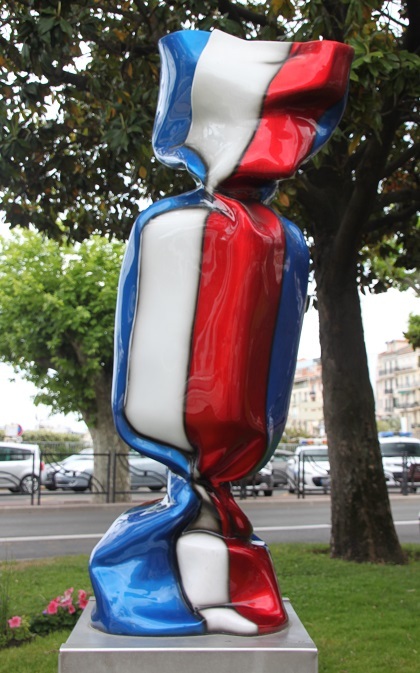 I remember those sweet-shaped sculptures from my trip, my sister and I loved trying to find them scattered over the city! 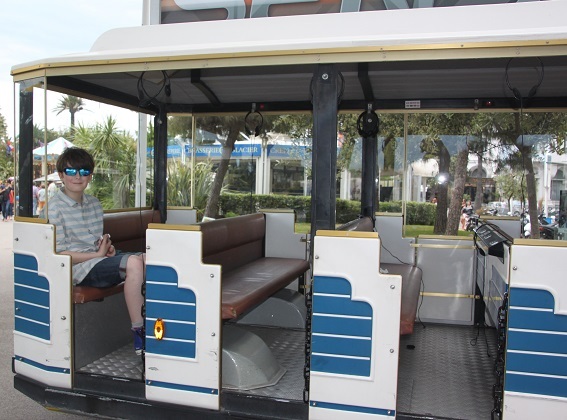 It has to be said, I love taking a trip on those little tourist trains – they were always a feature of family holidays! They are loads of fun – and a great way to save your legs!! They are indeed, especially in hilly towns/cities! Looks idyllic Joy! Somewhere I’ve always wanted to go..the train actually looked really cute! It was a fun little train and we got to see a lot – plus save our legs on those steep hills, win win!! Looks idyllic Joy! Not sure if this is. Second reply – on my phone not in such great reception! It is a part of the city that seems to surprise a lot of people Rosemary and although we loved the glitz and glamour this was my favourite part. It is just gorgeous and as you say the pastel colours are so beautiful. Keep warm – a cup of tea and blogging in the cozy indoors sounds perfect when the elements are raging outside!! Such lovely photos, reminds me of the week we spent there many years ago. I always love those tourist trains but my family refuses to board, LOL! And I also agree with your son – there’s always a time for a crepe. 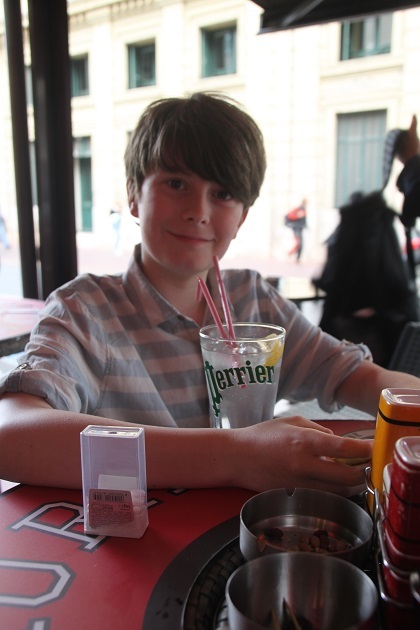 He can eat his body weight in crepes – just as will there were lots of hills to walk them off!! Oh I love these little towns with small streets, so pretty and picturesque ! I know, you could just wander here endlessly soaking up the atmosphere. 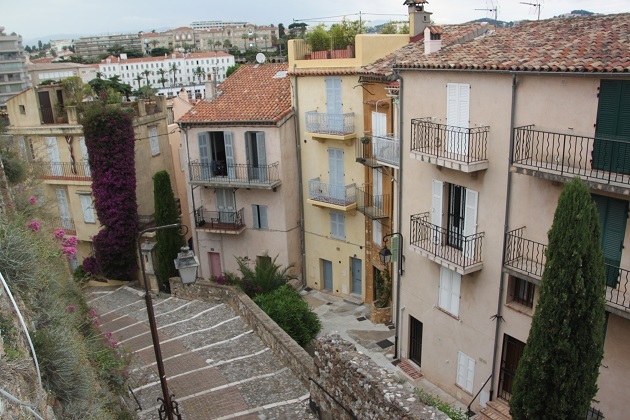 Cannes (old) is truly a lovely village. I guess I thought is was all glitzy and glamorous, but you searched out the best! Enjoyed seeing the way normal folks live! 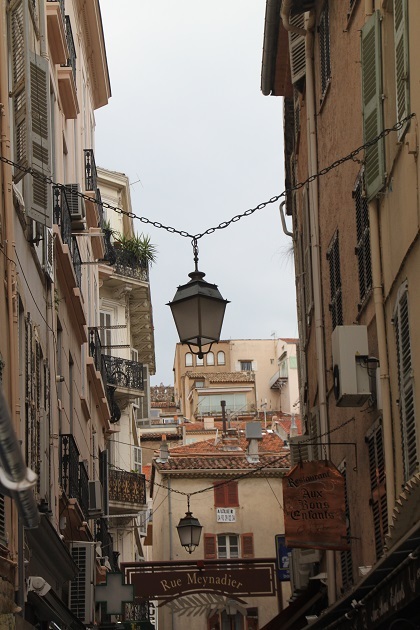 Absolutely Pam – there is plenty of glamour and loads of glitz but although we enjoyed seeing that side of Cannes, we loved the old part even more, wonderful buildings and a maze of gorgeous streets ideal for exploring. Thanks for the tour Joy. I could spend days wandering around those cobbled streets & alleyways. We did do exactly that – it’s so perfect to stroll and soak up the atmosphere.